Hawai‘i’s unique and isolated ecosystems are home to many species found nowhere else in the world, including the critically endangered Hawaiian monk seal and the threatened Hawaiian green sea turtle. Hawai‘i is also home to the endangered hawksbill sea turtle, and 25 species of whales and dolphins have been documented in Hawaiian waters. All of these species are protected under the Endangered Species Act and/or the Marine Mammal Protection Act, as well as State Law. Fishing is an important our way of life and our livelihoods in Hawaiʻi. Below you can find best practices for how to catch fish and avoid harmful interactions with protected species. Why use a Barbless Circle Hook? It’s better for the fish. It’s easier to quickly release unwanted catch without causing damage to the fish, which means more and healthier fish for you to catch in the future. It’s better for you. Minimize injury to yourself and others, as well as damage to shirt, shorts, and nets. It’s better for Hawai‘i’s protected species. Barbless hooks reduce potential injury in the event of an accidental hooking or entanglement, and allow for quicker release or self-shedding release to reduce trauma and enable a return to normal activities. And barbless circle hooks work! Preliminary studies on barbless circle hook effectiveness show that they work just as well as barbed hooks. And barbless fishers win tournaments! Check out the Barbless Circle Hook Project on Facebook and Instagram to see more photos of successful barbless circle hook catches. Use a small hand crimper (for Mustad 16/0 and smaller hooks) or large bench crimper (for Mustad 18/0 and larger hooks) to flatten a circle hook’s barb. A pair of parallel-jawed pliers can also be used in place of a hand crimper to flatten down the barb on smaller hooks. A barbed circle hook converted to a barbless hook using a crimping tool to flatten the barb. Use a hand crimper for small hooks, and a bench crimper for large hooks. 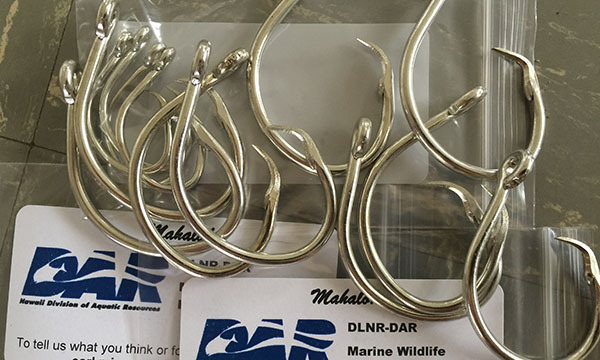 To get FREE Barbless Circle Hooks, contact DAR’s Marine Wildlife Program at 808-295-6483 or by email. If you accidentally catch a sea turtle, IT’S OK TO HELP! Just remember, SAFETY FIRST (for you and the turtle)! Reel in turtle with care. Please bring in the animal for disentanglement. Do the best you can to reel-in (land) the animal carefully. DO NOT drag a turtle up a cliff. Hold turtle by its shell and/or flippers. Cut line close to hook as short as possible. Remove the hook only if it can be done without injury to you or the turtle. If the hook barb is exposed smash the barb down to easily extract the hook and shorten the handling time of the turtle. DO NOT remove the hook if swallowed. 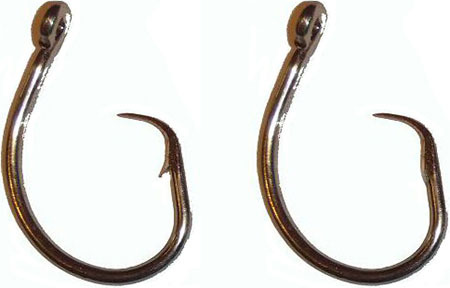 If using a barbless hook (see above), then the hook should easily come out. Release turtle with no line attached. Remove any line from flippers, head and neck. Help to remove any remaining line from the reef. Dispose of the line in a responsible manner. 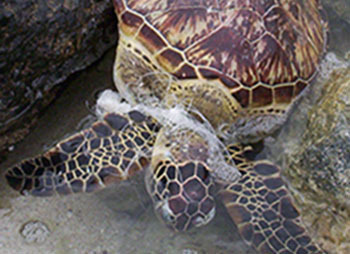 Line entanglement around flippers, head or neck is the greatest threat to sea turtles so please remove as much line as possible! Hookings are often life threatening for seals and other species. BE A HERO AND REPORT! If you hook a seal or see a sick or injured seal, whale, dolphin, or turtle, please call the NOAA Marine Mammal Stranding and Entanglement Hotline: 1-888-256-9840. 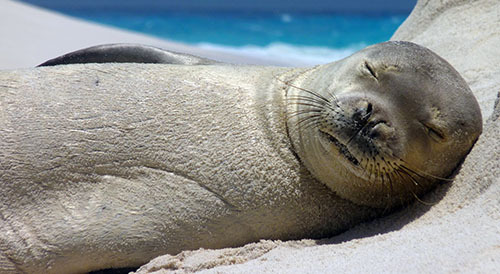 Monk seal sightings are still relatively rare so we also want to know if you see a monk seal! Please click here to learn more about monk seals and how to report sightings. 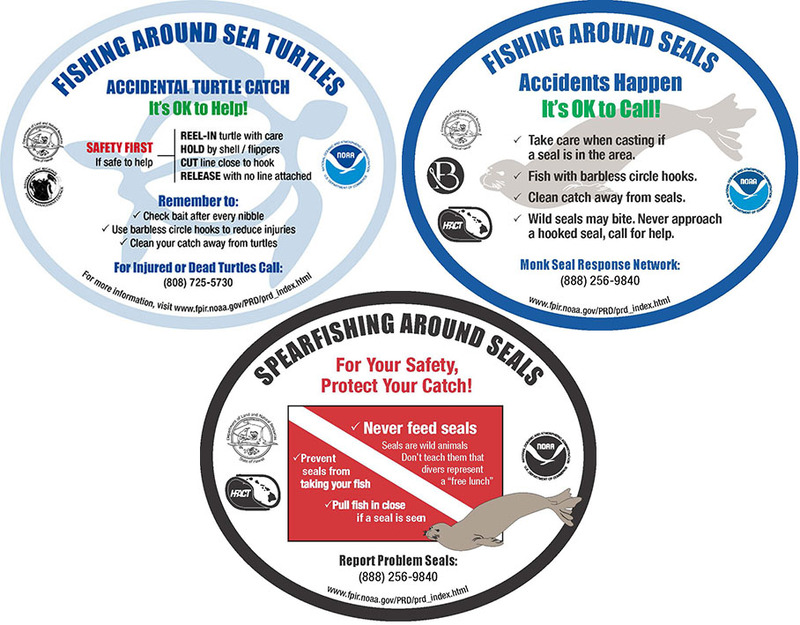 To get your own free reflective decal, contact DAR’s Marine Wildlife Program at 808-295-6483 or by email.